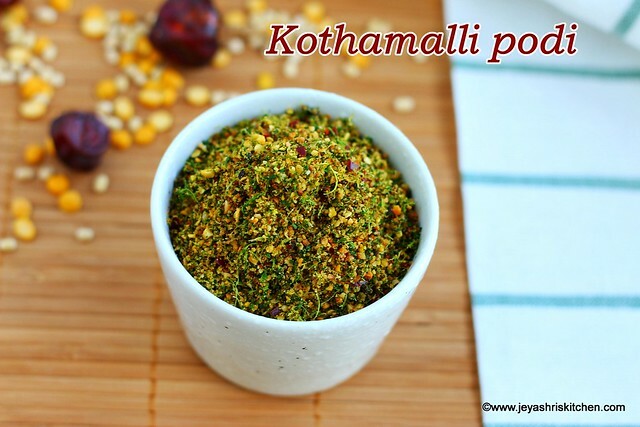 Kothamalli podi is an easy South Indian podi recipe, which can be mixed with rice and served for lunch or dinner. Roast in a medium low flame till they turn nice golden brown. Do not burn it. Let all the ingredients be in the hot pan. Do not cook the coriander. Let this get completely cool and you can see the coriander leaves turn bit crispy. Ensure it is not even warm,should be cool. Else the podi will become soggy. Add salt and pulse this for few times in a mixie. It should become a coarse powder. 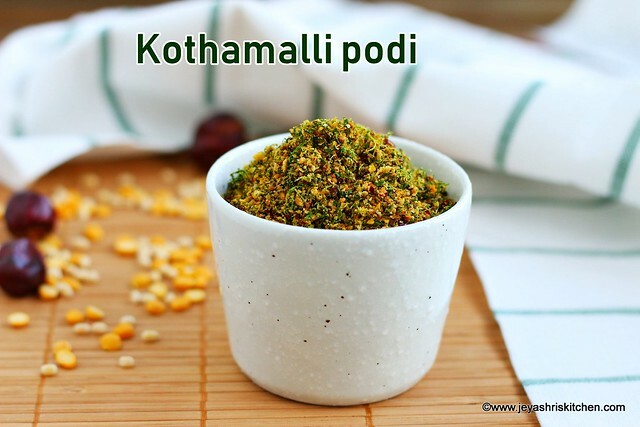 Kothamalli podi | Coriander leaves podi is ready. Store this in a clean air tight container in the refrigerator. This can be stored in the refrigerator for a month. Always use clean spoon for taking the kothamalli podi. This tastes best when mixed with hot rice and ghee. Also you can enjoy this with curd rice too. Always grind this when the mixture is completely cool. 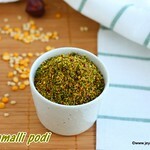 You can smear this podi on idli or dosa too. Addition of tamarind balances the spiciness in the kothamalli podi.